The DCS-3110 is a high performance PoE Fixed Network Camera that offers high-resolution capabilities and a wider field of view for more detailed and complete surveillance. 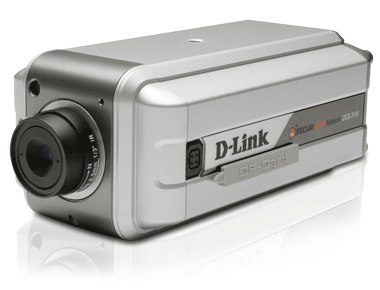 The D-Link® DCS-3110 Fixed Network Camera is a high performance megapixel camera designed for professional surveillance and security applications. Equipped with a 1.3 Megapixel Progressive Scan CMOS sensor and a 6mm Lens, the DCS-3110 allows you to capture a wider field of view with a resolution of up to 1280 x 1024. The built-in ICR filter in the DCS-3110 provides automatic Day/Night functionality, adjusting the image from color during the day (and in low-light conditions) to monochrome at night (or in extremely poor lighting conditions). With features such as simultaneous MPEG-4/MJPEG streaming, multicast MPEG-4 streaming, PoE support, a built-in Compact Flash card slot, and connectivity to a variety of external devices, the DCS-3110 is an extremely versatile solution for high quality, high resolution viewing and reliable recording throughout the day. The DCS-3110 supports simultaneous streaming of MPEG-4 and MJPEG video to provide both high quality and bandwidth efficient compression formats. MJPEG delivers greater file integrity, making it ideal for detailed monitoring situations. MPEG-4 has smaller file sizes, making it more useful for extended recording periods or for use in low bandwidth networks. Additionally, the DCS-3110 supports multicast MPEG-4 streaming allowing users to view content by subscribing to a multicast IP address on the network. The DCS-3110 includes digital input and output ports (one each) allowing connectivity to external devices such as IR sensors, switches, and alarm relays. It also comes with a RS-485 interface, providing connectivity to an optional Pan/Tilt enclosure, which effectively adds pan/tilt functionality to the DCS-3110. Additionally, a 12V interface provides power for an optional LED illuminator. Support for 3GPP Mobile Surveillance1 allows you to view a live video feed from your compatible Internet-ready mobile phone with a 3GPP player installed. This extends your monitoring capability without requiring the use of a computer, allowing you to check your camera’s video feed while on-the-go. The DCS-3110 comes with a built-in microphone and audio ports allowing 2-way audio communication2 when an external speaker is connected and even includes an audio switch to ensure privacy when needed. The DCS-3110 also comes with a built-in Samba client for NAS so there is no need for a direct connection to a PC or any other hardware or software to capture and transfer images. Equipped with 802.3af Power over Ethernet (PoE) support3, the DCS-3110 can receive both power and data over a single Ethernet cable, allowing you to place this camera in locations without a power outlet. 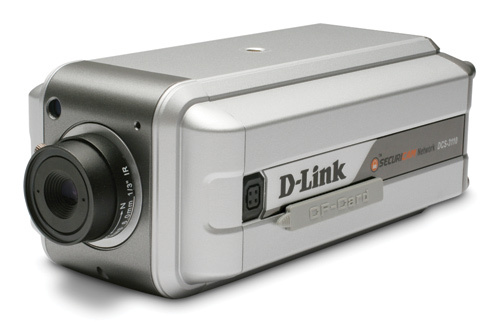 The included D-Link D-ViewCam™ 2.0 software enables you to manage up to 32 network cameras, set e-mail alert notifications, set recording schedules, and trigger motion detection to record directly to your hard drive. D-ViewCam 2.0 also allows you to upload a floor plan of your business and create a realistic layout of where your cameras are located, further simplifying the management process. 1. The mobile device must be Internet-ready. Support Real Time Streaming Protocol (RTSP) and be equipped with a 3G video player such as PacketVideo™, Quicktime™, or RealPlayer™, and have Internet access. 2. Use of audio or video equipment for recording the image or voice of a person without their knowledge and consent is prohibited in certain states or jurisdictions. The end-user assumes all liability for compliance with applicable state, local, and federal laws. 3. A PoE switch or router is required to provide power via the Ethernet connection.  Electronic Shutter: 1/60 sec. ~1/100,000 sec. * Use of audio or video equipment for recording the image or voice of a person without their knowledge and consent is prohibited in certain states or jurisdictions. The end-user assumes all liability for compliance with applicable state, local, and federal laws. ** A PoE switch or router is required to provide power via the Ethernet connection. *** The mobile device must be Internet-ready. Support Real Time Streaming Protocol (RTSP) and be equipped with a 3G video player such as PacketVideo™, Quicktime™, or RealPlayer™, and have Internet access. **** Computer must adhere to Microsoft’s recommended system requirements. Please contact Microsoft for details.